Last Tuesday the U.S. Senate voted on a historic piece of legislation. Known to the public as the U.N. Disabilities Treaty, the document borrows wording and spirit from the Americans with Disabilities Act of 1990. The treaty has so far been signed by 155 nations throughout the world; a list which unfortunately does not include the United States, where the vote fell just short of the two thirds majority required to ratify the treaty. Although the treaty can be voted on again in next year’s congress, for the one in six Americans that are disabled, that’s too long. By the U.N.'s estimates, there are over 600 million people worldwide who live with disabilities. In the U.S. that number is an astounding 54 million. Some of the challenges that people with disabilities face are obvious. Staircases can be bypassed via elevator and closer parking spots can make getting into places more accessible. Some of the challenges may not cross your mind. One of the most entrenched challenges that people with disabilities face is something a lot of us take for granted -- bathroom access. After all who among us would go to a football game if there were no bathrooms? Or a graduation? How about a theme park or a movie theater? How often would you go out if you had to return home to go to the restroom? It was in light of these questions that Wilmot Modular and the Maggie’s Light Foundation created the EasyGo™ Wheelchair Accessible Family Changing Room. The key word here is family. The EasyGo™ is wheelchair-accessible and contains an adult-sized changing table, allowing individuals with severe mobility issues to use the bathroom in the same privacy that everyone should enjoy. With the ability to use the restroom privately, people with special needs can enjoy a freedom which they’d be hard-pressed to find elsewhere. Just as vitally their families and caregivers can too. The world gets so much bigger when you’re not tethered to your house. 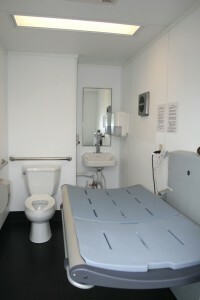 The comfort granted by safe, accessible bathroom facilities is immense. It’s about more than shopping or event attendance... it’s about community. It allows people with special needs to see and be seen, bringing us closer together and opening a dialogue about the reality of our special needs community. Recently our EasyGo™ made an appearance at Kennedy Krieger’s Festival of Trees at the fairgrounds in Timonium, MD. With a bathroom everyone could use, the event became open and inviting to the special needs community. We look forward to the day when the needs of people with disabilities are fully met and when they can enjoy the same freedom as everyone else. We believe the EasyGo™ is a big step towards that freedom, but the fight is long from over. Until then we can only do our best to care for those in our society who need it the most. Learn more about offsite construction planning solutions for modular buildings.